Our art competition for September was the 5th Annual “SeaScapes” and 2D and 3D artists (including photography) from around the world were called upon to make online submissions for possible inclusion in to the Gallery’s October 2015 online group art exhibition. The “SeaScapes” theme was considered to be any art with the subjects being scenes of coastal living, any ocean activities, seaside vistas and any related seashore subjects for inclusion into this art exhibition. This art competition and the submission process and competition for the artists began in August 2015 and concluded on September 26, 2015. The gallery received 419 entries from 18 different countries from around the world, including Australia, Austria, Canada, France, Hong Kong, India, Ireland, Italy, Niue, Philippines, Portugal, Russia, Saint Maarten, Scotland, Sweden, Netherlands, United Kingdom and Wales. In addition, the gallery received entries from 27 different states. We hope that you will take the time to also enjoy their beautiful art work too. To view the artwork in each media category, click on a thumbnail image and that will take you to the Slide Show, which contains larger images. In order to leave the Slide Show at any time, just click on a large image in order to escape and that will take you back to the thumbnails. All winning entries will now be featured on the Light Space & Time website for the month of October 2015 and thereafter, the artworks and links to the artist’s websites will remain online in the Light Space & Time Archives. 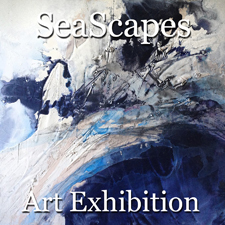 Congratulations to our artists who made our “SeaScapes” Art Exhibition so successful this month. At any time, we invite our winning artists and other interested visitors to link their websites to the Gallery’s archive page for further ongoing promotion. Overall Winning Artists Category – The overall winning artist’s category consists of the 10 Best Entries received from the Painting & Other and Photography & Digital categories. Please go to the results of the SeaScapes Art Exhibition “Overall Winning Artists” Category here. Special Merit Award Category – These are the artists and their artwork which we felt could easily have been placed higher but due to the size constraints in each media category, this art was placed in this special category. Any of the Special Merit art, in many cases, is interchangeable with the best art that we selected for the top tiers. Please go to the results in the SeaScapes Art Exhibition “Special Merit Award Category” here. Painting & Other Category – The painting & other category is considered to be any art where a pigment was applied to a two-dimensional surface, such as canvas, paper, or panel. This category comprises the following media; acrylics, oil, pastels, watercolor, gouache, tempera, ink, encaustic, fresco, etc. applied on canvas, canvas board, paper or any other flat surface. In addition, this category includes any 3D art, fabric, mixed media, mosaic, line type drawings and various other media. Please go to the results in the SeaScapes Art Exhibition “Painting & Other Category” here. Photography & Digital Category – This category contains any images captured by either an analog or digital camera and would be viewed as a print. Black and white photographs, color photographs, digital or analog photographs, photo grams, other experimental photography, alternative photographic processes, manipulated photography etc. would be included in this category. In addition, we have included most digital art in this section. Please go to the results in the SeaScapes Art Exhibition “Photography & Digital Category” here.